Waqas Goraya had planned to move back to his native Pakistan and settle down after his wife finished her postgraduate studies in the Netherlands this month. Now the idea seems impossible to the social media activist, who paid an enormous price for blogging to raise political awareness and campaign against human rights violations, religious intolerance and extremism in Pakistan. Goraya, an IT consultant, vanished in January with four other secular activists in Pakistan — a group that became known as the "missing bloggers." Released three weeks later under mysterious circumstances, Goraya won't discuss the circumstances of his disappearance, where he was held or who his captors were for fear of repercussions for family and friends in Pakistan. "Talking about extremism and criticizing the establishment in a country like Pakistan got me in trouble," Goraya told Voice of America in a telephone interview from the Netherlands, where he returned after his captivity. "That's a no-go area for Pakistan and no one talks about it. "There can be confusion, but we've never been anti-Pakistan or anti-Islam or anti-society," said Goraya, who lived in the Netherlands before making a visit to Pakistan last year. "We're not losers sitting in a dark place and just blogging about negative things. That's not the case." If his captors' goal was to shut him up, it's working, Goraya said. He is too frozen to resume his social media activism, at least for now. "Abduction is 10 percent of the horror. The other 90 percent begins after you're released," he said. "I'll continue blogging, but it will take some time." Goraya's wife, Mesha Saeed, said, "Waqas's abduction has jolted us as a family, and we need time to recover from the shock. When Waqas came back, he couldn't sleep for days. He just wanted to see me and our son all the time." Pressured on all sides, Pakistan has become a dangerous, even deadly place for journalists. It ranks 147th in the World Press Freedom Index compiled by Reporters Without Borders (RSF). "Journalists are targeted by extremist groups, Islamist organizations and Pakistan's feared intelligence organizations, all of which are on RSF's list of predators of press freedom," the group's website says. "Although at war with each other, they are all always ready to denounce acts of 'sacrilege' by the media." Human rights watchdog Amnesty International recently wrote an open letter urging Pakistan's government to take concrete measures to protect the lives of bloggers, activists and journalists. 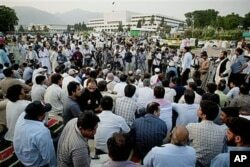 FILE - Pakistani journalists hold a protest rally and sit-in-protest outside the Parliament to condemn the killing of their colleague, Syed Salim Shahzad, this week after he reported being threatened by intelligence agents, in Islamabad, Pakistan, June 15, 2011. Human rights activists and lawmakers say enforced disappearances, including torture, have become a norm in Pakistan and that the country's security agencies are responsible. "Human rights activists and NGOs, the broader community and journalists believe the bloggers were abducted by the Pakistani intelligence agencies," said Brad Adams, Asia director at Human Rights Watch. "The missing persons are often mistreated and then told upon release that if they speak, there will be retaliation against them or their families or their friends." Adams added. "I'm not sure if this happened in the bloggers' case." Pakistan's Interior Ministry and army have repeatedly and strongly denied any involvement in or link to the abductions of bloggers and other activists over the past few years. "The army or intelligence agencies had nothing to do with the abduction of the bloggers," Major General Asif Ghafoor, director general of the armed forces media wing, said in a statement to VOA. Pakistani defense analyst Ayesha Siddiqa believes the bloggers were "made an example of" because they crossed the line by reporting on sensitive political issues controlled by the powerful military. "The state doesn't want people to remember the way Baluchistan is being run," Siddiqa told VOA. "It's a political problem, essentially, and that's how it should be dealt with, rather than militarily." Goraya and several friends started their social media activism in 2011 to create "some sort of discourse," he said. "The turning point in my life was the murder of Salman Taseer, who was killed in 2011 because he demanded to review the blasphemy law," Goraya said. "That was the time I realized, 'We have to speak.' "
FILE - Students chant slogans while holding banners and posters showing Mumtaz Qadri, the alleged killer of Punjab governor Salman Taseer, during a rally to protest against any attempts to modify blasphemy laws, in Karachi, Pakistan, Jan. 20, 2011. The sole purpose was awareness. His anonymous blogging through the Facebook page "Mochi" quickly grew a huge audience. After his disappearance, he is pondering new plans for the future. There was a campaign against the bloggers on social media, and some well-known TV hosts blasted them, too. Amir Liaquat Hussain showed content and screenshots from their Facebook pages and labeled them as "blasphemers.'' The Pakistan Electronic Media Regulatory Authority banned him from appearing on television for spreading hate speech. "Right now, it looks like I may never be able to go back to Pakistan," Goraya said. "I'll be a marked person due to blasphemy, and it doesn't matter how hard I try to explain myself. They'll not listen to me." 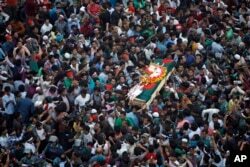 Human rights defenders, social activists and families of bloggers believe that such blasphemy allegations are aimed at punishing activists for criticizing the government and the military. "The best way in Pakistan to silence voices is to accuse somebody of blasphemy, and people will come and dispense justice in their own way." Siddiqa said.